Figure 3.11. Filtration and metabolism of FLCs. 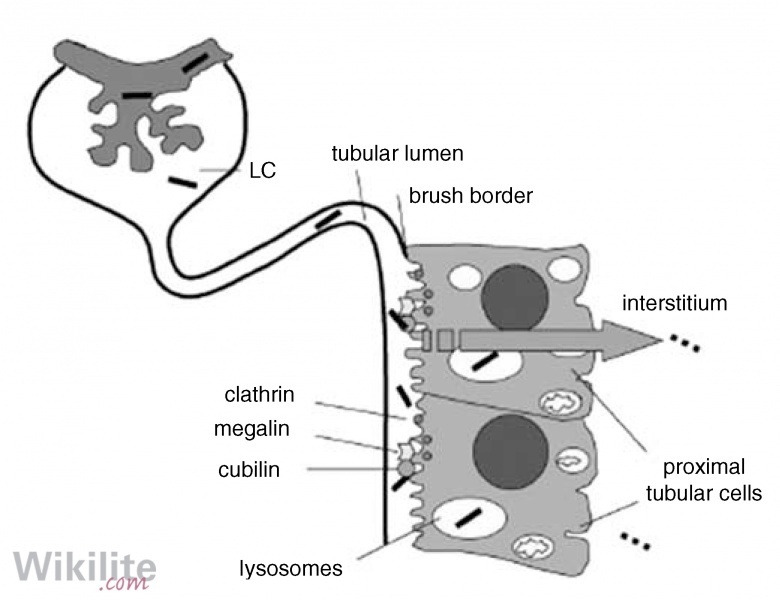 FLCs are filtered through the glomerulus and pass into the proximal tubule, where they are endocytosed via the megalin/cubulin receptor system. Within the proximal tubular cells they are degraded in lysosomes. (Reprinted by permission from Macmillan Publishers Ltd: Leukemia , copyright 2008). Figure 3.12. Changes in serum and urine free light chain concentrations during the evolution of a hypothetical patient with light chain multiple myeloma. Figure 3.11 shows the glomerular filtration and metabolism of FLCs within a kidney nephron. Each nephron contains a glomerulus with basement membrane fenestrations, which allow filtration of serum molecules into the proximal tubules. Pore sizes are variable, with restricted filtration of molecules that are greater than 20 kDa in size, and a molecular weight cut-off of around 60 kDa. Protein molecules that pass through the glomerular pores are bound by the multi-ligand megalin and cubulin receptors on proximal tubule epithelium; these are then absorbed unchanged, degraded in the proximal tubular cells into their constituent amino acids, or excreted as fragments . This megalin/cubulin absorption pathway is designed to prevent loss of large amounts of proteins and peptides into urine. It is very efficient and can process between 10 and 30 g of small molecular weight proteins daily. Therefore, the 500 mg of FLCs produced each day by the normal lymphoid system are filtered by the glomeruli and completely processed in the proximal tubules . In normal individuals, between 1 and 10 mg of FLCs are excreted per day into the urine. Their exact origin is unclear, but they probably enter the urine via the mucosal surfaces of the distal part of the nephrons and the urethra, alongside secretory IgA. This secretion is part of the mucosal defence system that prevents infectious agents entering the body. Because of the huge metabolic capacity of the proximal tubule, the amount of FLCs in urine (even when production is considerably increased in a patient with MM), is more dependent upon renal function than synthesis by the tumour. As a consequence, serum and urine FLC concentrations may differ during the evolution of light chain MM (LCMM) (Figure 3.12). From low initial starting concentrations, sFLCs increase steadily with growing tumour mass, while concentrations in the urine show little change until the proximal tubular metabolism is exceeded and overflow proteinuria develops. Hence, early disease and oligo-secretory disease are not identified from urine tests. Subsequently, urine FLCs rise rapidly as overflow occurs, to reach a maximum. Concentrations then decrease as renal impairment occurs, and are low in complete renal failure. By contrast, sFLC levels increase as renal impairment develops due to the lengthening half-life of FLCs that are no longer cleared by the kidneys. 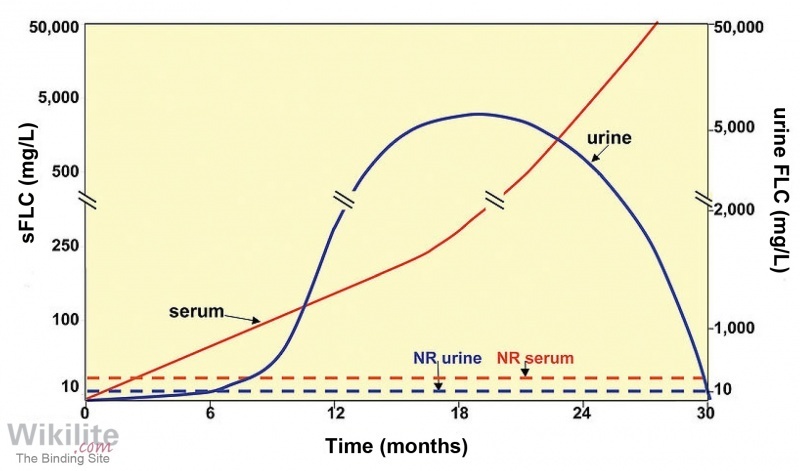 Because of the biphasic urine curve, decreasing concentrations may indicate response to treatment or deterioration of renal function. Urine measurements are therefore unreliable during disease monitoring. Serum levels, however, rise or fall in correct relationship to worsening or improving disease status. The merits of serum over urine testing are further discussed in Chapter 24.